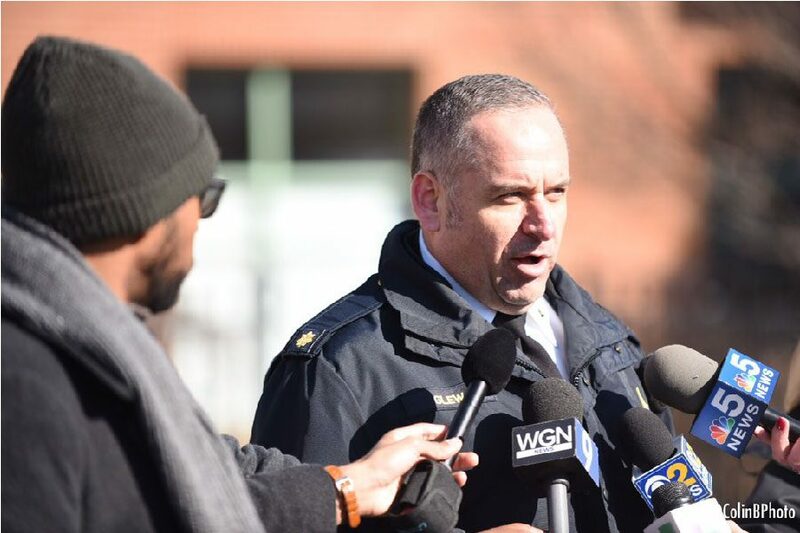 Reports of man with gun on campus determined to be hoax, "swatting incident"
Evanston police Cmdr. Ryan Glew. Evanston police Cmdr. Ryan Glew told reporters Wednesday afternoon that reports of a man with a gun on the Evanston campus are the result of a hoax. Glew called it a “swatting incident.” A man called police at 2:17 p.m. and said he had shot his girlfriend at 1915 Maple Ave., Engelhart Hall, a graduate student housing dorm. Students and Northwestern community members were informed of the incident through emergency phone and email alerts and told to shelter in place on the Evanston campus. The shelter in place warning for those who were not in Engelhart Hall was lifted just before 4 p.m. The phone call is thought to have come from “outside of the Chicagoland area,” Glew said, somewhere southeast of Rockford, Illinois. The person who was thought to be the girlfriend who was reportedly shot was located and is safe, Glew said, and officers don’t believe she was involved in the swatting incident. Glew said swatting incidents can become dangerous. “It’s very dangerous, anytime that you have a response, that people officers that are armed coming with a SWAT response to what they believe is an active shooter, or somebody who has been shot. Yeah, it is dangerous,” he said. Earlier in the day, hundreds of students, faculty and administrators had rallied on campus as part of the nationwide walkouts to advocate for gun reform in the wake of the shooting at Marjory Stoneman Douglas High School in Parkland, Florida. University President Morton Schapiro and Mayor Steve Hagerty attended the event. A vigil planned for later this evening in memory of the 17 people killed in Parkland has been postponed, the organizers announced on Facebook. This story was updated at 4:45 p.m. and 5:22 p.m. with additional information.